I searched for both free labels and those that need to be purchased and just wasn't happy with anything I was finding. The labels needed to be simple and neutral, but not boring. The ones that I found that I did like didn't have ALL the spices that I needed. I finally gave up and decided to just make some myself.....and then knew I needed to share them with you! For my jars, I put a label on both the front of the jar and on the top of the lid. These jars were purchased many years ago at Bed, Bath, and Beyond. They still have a variety of great bottles in different sizes, as does places like Target and World Market. These exact bottles are also available on Amazon (affiliate link), along with many other versions. The labels were printed on full sheet label paper (affiliate link) available from Avery. Each label is designed with two different fonts....one simple bold font for the main part of the name, and another script font for words like ground and whole. I love the look of the two paired together. The labels have circles around the outside with thin, thick, and dotted lines. Everything prints in a dark charcoal gray color. 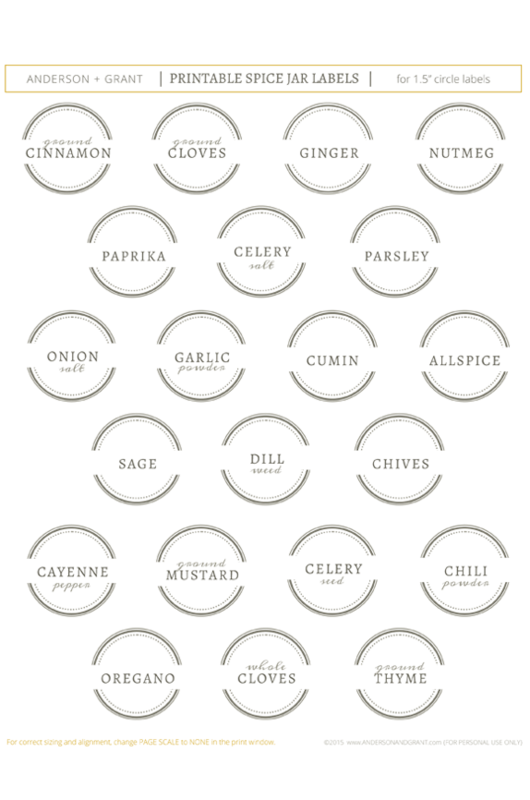 I created a PDF page of commonly used spices for you to download for free. They can be punched out of the label paper with a 1 1/2 inch round hole punch (affiliate link). These are not designed to be printed on pre-punched Avery labels, though, because many times the alignment of different printers causes the labels to not print correctly. The link to print your own labels follows at the end of this post. It is practically impossible for me to think of every spice that you might need, so I also have custom labels available for purchase. With these, you'll be able to create a list of ALL the labels that you'll need, and then I will design the labels for you. You will also have the opportunity to change the color of the design around the outside or the font. It can be tricky to get the backing off of the round sticker once it has been cut. To help it come off easily, peel the backing away from the sticker BEFORE cutting the circles out and then press it back down. When punching out your stickers, turn the hole punch upside down so that you can see exactly where you are punching. That way you can ensure that the design around the label is centered on your sticker. And finally, to protect the print on the labels and make them easy to wipe off, lay your sticker sheet down onto clear contact paper to "laminate" the label before cutting them out. This adds a great smooth surface to the label and I love not having to worry about destroying the label when I wipe off the jar. 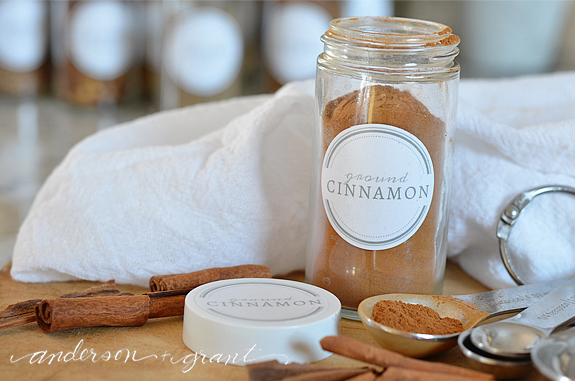 It is so nice to see all my jars look clean and pretty again with their new labels! I hope that they give you a little incentive to start organizing your spices. 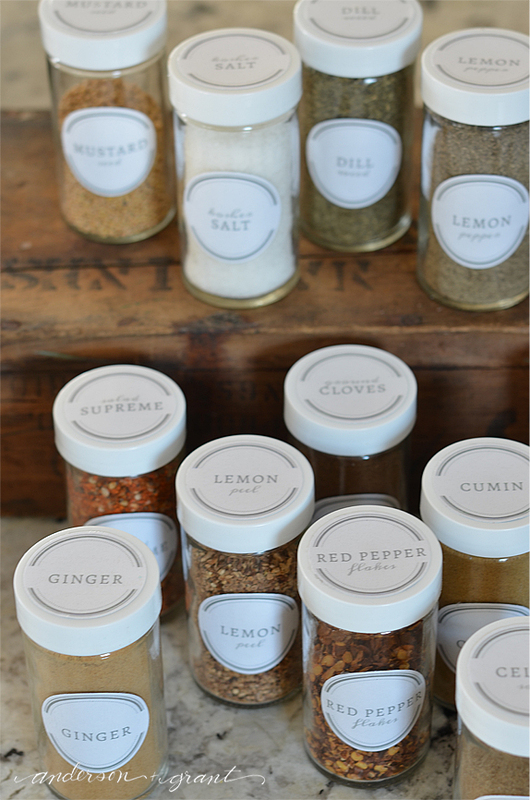 To purchase a custom set of spice jar labels, click here. 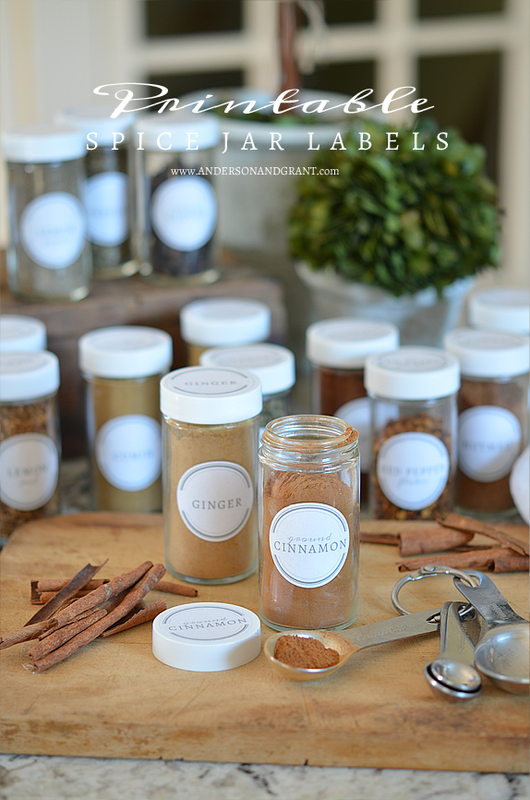 To download the free basic set of labels, click here.